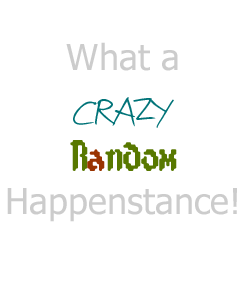 2013 March : What a Crazy, Random Happenstance! Today was the last for Girl Scout cookie sales. Boo did amazing for her first time, 200 boxes! She probably would have sold more if the weather would have been better. Even when there wasn’t snow on the ground it was just to cold. Speaking of cold, I WANT SPRING!!! I think we all do though. This has just been a miserable winter. Crazy snow storms, loss of power, being cooped up inside, it’s enough to drive anyone nuts! Spring is my second favorite season. I love watching everything come back to life and there is a smell to spring, just like fall, that fills your soul. It’s refreshing. Here’s hoping we won’t have to be waiting long and that the snow on the ground outside is the last we will see for months to come. Until then I will be cuddled up in my blankets. Wow! It’s been almost a year since I last posted. Craziness! I’m writing because while I love Pinterest there are some things about it that drive me crazy. I have stopped automatically re-pinning . If there is something that catches my eye, I like it. When I remember, I go into my likes and go through them. Unlike the pin. I currently have almost 2000 likes and most of them are ones I need to go through. I do “like” some items that I don’t re-pin. I also do re-pin a few things, such as images that I don’t check the link. I know I should so the right person get the credit but some people I know always pin from the source or check the pin to make sure it is correct. When you follow someone you know who does that it makes re-pinning a lot easier.